If your blood pressure is usually above 140/90, you have high blood pressure, or hypertension. That means the top number is 140 or higher and the bottom number is 90 or higher, or both. Despite what a lot of people think, high blood pressure usually doesn't cause headaches or make you feel dizzy or light-headed. It usually has no symptoms. But it does increase your risk for heart attack, stroke, and kidney or eye damage. The higher your blood pressure, the more your risk increases. Changes in your lifestyle, such as staying at a healthy weight, may help you lower your blood pressure. Your treatment also will include medicine. If you stop taking your medicine, your blood pressure will go back up. If you stop taking your medicine, your blood pressure will go back up. You may take one or more types of medicine to lower your blood pressure. Be safe with medicines. Take your medicine exactly as prescribed. Call your doctor or nurse call line if you think you are having a problem with your medicine. See your doctor at least 2 times a year. You may need to see the doctor more often at first or until your blood pressure comes down. If you are taking blood pressure medicine, talk to your doctor before you take decongestants or anti-inflammatory medicine, such as ibuprofen. Some of these medicines can raise blood pressure. Learn how to check your blood pressure at home. Stay at a healthy weight. This is especially important if you put on weight around the waist. Losing even 4.5 kilograms can help you lower your blood pressure. Avoid or limit alcohol. Talk to your doctor about whether you can drink any alcohol. Eat plenty of fruits (such as bananas and oranges), vegetables, legumes, whole grains, and low-fat dairy products. Lower the amount of saturated fat in your diet. Saturated fat is found in animal products such as milk, cheese, and meat. Limiting these foods may help you lose weight and also lower your risk for heart disease. Do not smoke. Smoking increases your risk for heart attack and stroke. 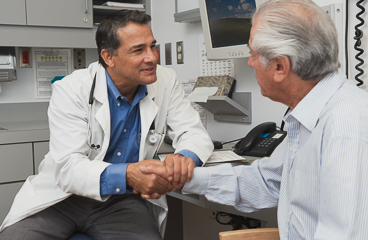 If you need help quitting, talk to your doctor about stop-smoking programs and medicines. These can increase your chances of quitting for good. Enter X567 in the search box to learn more about "High Blood Pressure: Care Instructions".